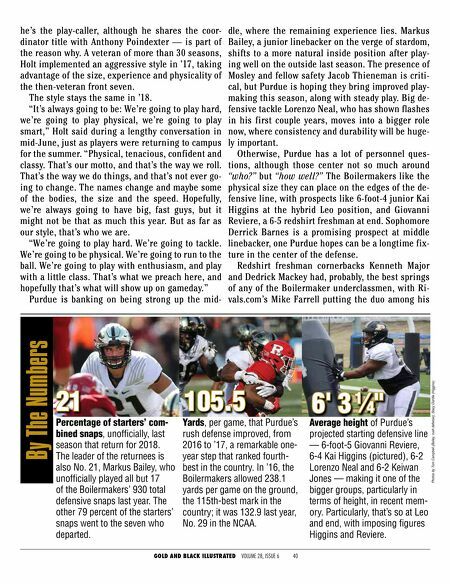 GOLD AND BLACK ILLUSTRATED VOLUME 28, ISSUE 6 41 "five players who shined" from the Big Ten during the spring. They'll join veterans Tim Cason and An- tonio Blackman, along with the experienced safe- ties, in what Purdue figures to be a strong defen- sive backfield. But that secondary might be asked to do more, because the Boilermakers have a glaring issue that rises above the rest: Do they have a viable option at strongside linebacker? And if not, does that force Holt to play a base nickel this season? That would be a less-than-ideal scenario considering some of the ground-oriented opponents Purdue faces in the Big Ten West. It's a question that's being pondered right now. "Are we going to be more of a this type of team or that type of team?" said Holt, illustrating the pre-camp decisions that he and the defensive staff considered. "We love to be multiple. We need to be multiple. The thing that I always have done as a coach is I like to be big, especially in this confer- ence. I want to be big and physical. (With) guys that can run to the ball. You try to find big guys that are physical that run to the ball and try to make it work and match up in your schemes. Right now, there are some positions where we just don't have a lot of big guys. That's what we do as coaches in the summer. You try to make everything fit and try to be really good at what we do. That's what we're in the process of doing." 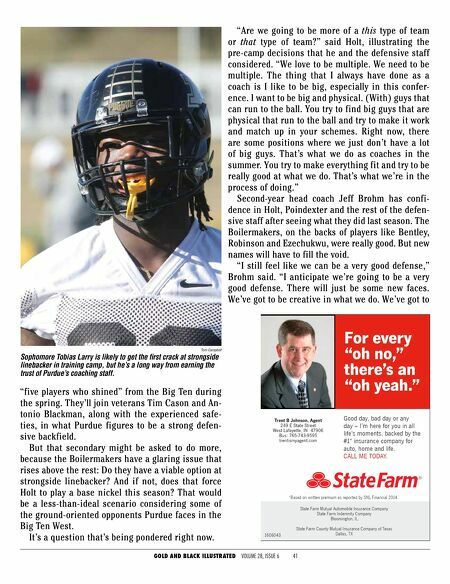 Second-year head coach Jeff Brohm has confi- dence in Holt, Poindexter and the rest of the defen- sive staff after seeing what they did last season. The Boilermakers, on the backs of players like Bentley, Robinson and Ezechukwu, were really good. But new names will have to fill the void. "I still feel like we can be a very good defense," Brohm said. "I anticipate we're going to be a very good defense. There will just be some new faces. We've got to be creative in what we do. We've got to State Farm Mutual Automobile Insurance Company State Farm Indemnity Company Bloomington, IL State Farm County Mutual Insurance Company of Texas Dallas, TX 1606043 Good day, bad day or any day – I'm here for you in all life's moments, backed by the #1* insurance company for auto, home and life. CALL ME TODAY. For every "oh no," there's an "oh yeah." *Based on written premium as reported by SNL Financial 2014. Trent B Johnson, Agent 249 E State Street West Lafayette, IN 47906 Bus: 765-743-9595 trentismyagent.com Tom Campbell Sophomore Tobias Larry is likely to get the first crack at strongside linebacker in training camp, but he's a long way from earning the trust of Purdue's coaching staff.